Oi! Dis here be the review for da new Ironjawz battletome! Da biggest and baddest greenskinz around are here to kick your teef in and if any squirrely grot say otherwize lemme know, I'll teach dem! Waaaaaaggggghhhh! 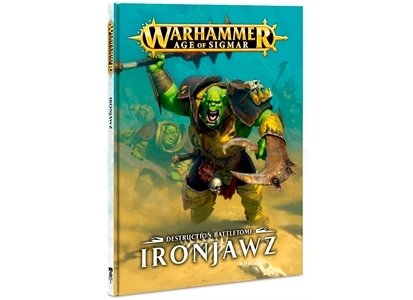 Well now that I got that out of the way lets take a look at the brand new Ironjawz battletome for AoS. This is a pretty important book, being the first battletome for Destruction and it was the first battletome for a non Order or Chaos army (Flesh Eaters closely followed this for Death). First things first, I love the cover on this. This is some great art and it really captures the feeling of the newest breed of orruks and also the realm of Ghur. The desert ground coupled with the clear blue skies really look awesome coupled with the rampaging orruks. It's nice to see skies that look natural and aren't just permanently stormy. The style of the artwork is also great and I think this can easily compete with the Seraphon and Fyreslayers books for my favorite AoS cover. 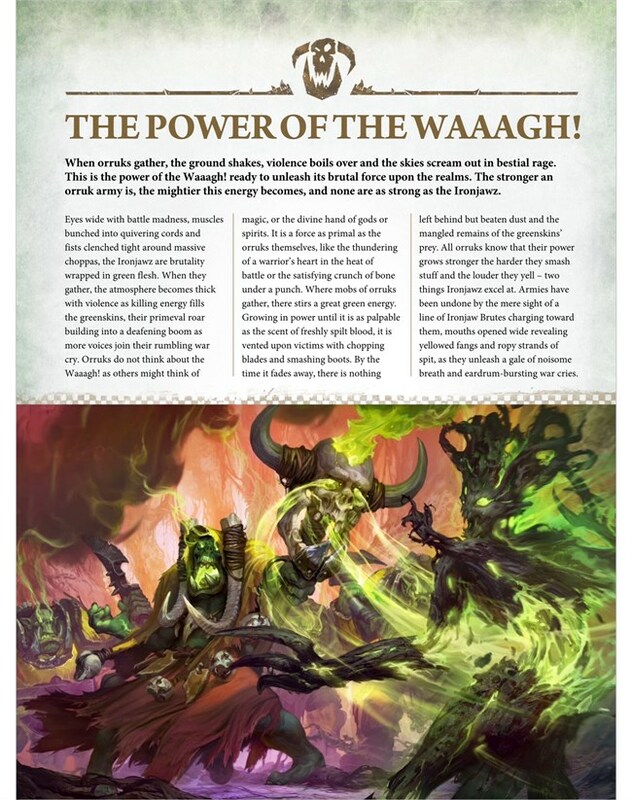 Once we crack open the book we are greeted with the lore for the Ironjawz and who they are. 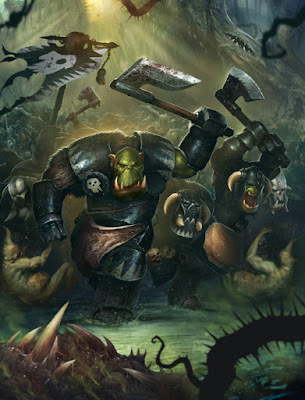 Essentially these are the orruks who took no gruff during the Age of Chaos, and just continued to grow stronger and stronger off the continual warfare. There are some great bits in here about Archaon sending one of his personal lieutenants to deal with the orruks who instead was roundly beaten and now adorns the walls of the Varanspire for his failure. Out of all of the races the Ironjawz are one of the few who actually flourished during the turmoil of Sigmar's absence. These massive greenskins are heavily armored, but they don't forge any of their armor, they leave that to the weedy 'Ard Boyz (formally the Black Orcs, so that shows you how tough the Ironjawz are that now those guys are considered weak). Instead they literally beat their armor into shape over their bodies with their bare hands. 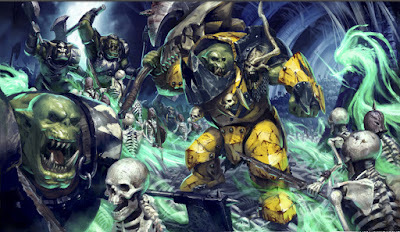 I really like the look of all of these guys and the armor is awesome, the yellow is even growing on me. There are some great proper orruky moments scattered around here too, like how their units are usually organized into groups of five since that's how high they can count on one hand. Some of the smarter ones have figured out if they use both hands they can get to ten, and legend talks about particularly smarts bosses who can count up to 20 using their feet as well, though few believe it. Stuff like that is awesome and definitely adds to the feeling of this being a true orruk book. There has always been a level of humor involved with the greenskins so I'm glad it has continued here. Some other fun bits is the fact that their armor and weapons are made out of pig iron, so called because iron is the only thing their gore-gruntas can't digest. So yeah, they get their iron from their boar's excrement. Propa orruky! 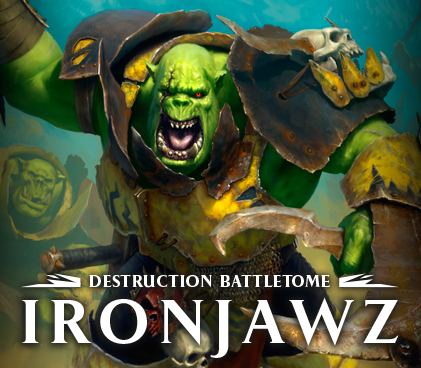 Once we are done with the general overview we get out timeline of events for the Ironjawz, which has some fun moments in it that act as great story hooks for later or for players to capitalize on their own. After that we get the individual unit entires where we go into more depth on everything. First up is Gordrakk, the Fist of Gork and leader of the orruks. This guy is truly awesome and really reminds me more of Ghazkull from 40k instead of Grimgor from the Old World. Grimgor was just all savage brutality and strength, where as Ghazkull had that as well, but his true strength was in his intelligence. 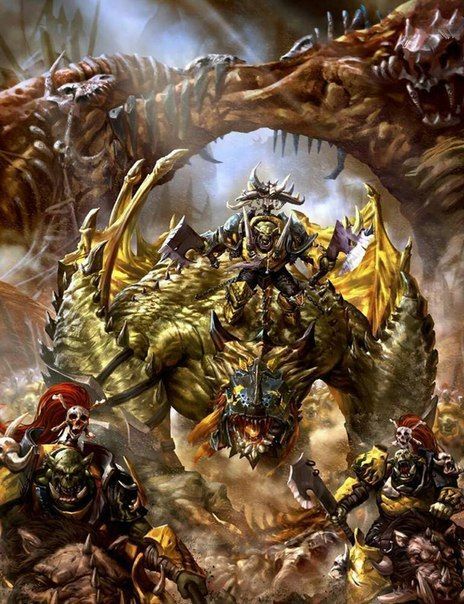 Gordrakk is much the same way, he is smart for an orruk and that makes him especially dangerous. I'm really interested to see where his story goes from here. Some other stand outs for me was the Weirdnob and the Warchanter. 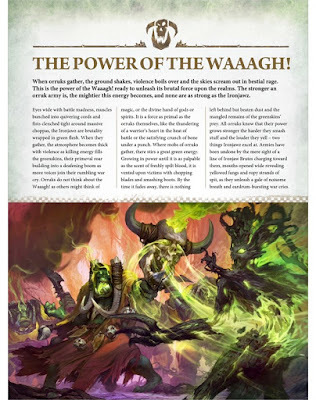 The Weirdnob is the Ironjawz shaman and actually acts as a leader if no Megaboss is present. Some tribes of Ironjawz only serve their Weirdnob, like one who paint their armor orange. The reason for this is because the shaman has a tendency to set his boyz on fire, and the orange armor makes it less distracting when he inevitably does that. The Warchanter is kind of like the Ironjawz battle standard bearer in that he act as a locus for them to focus on. 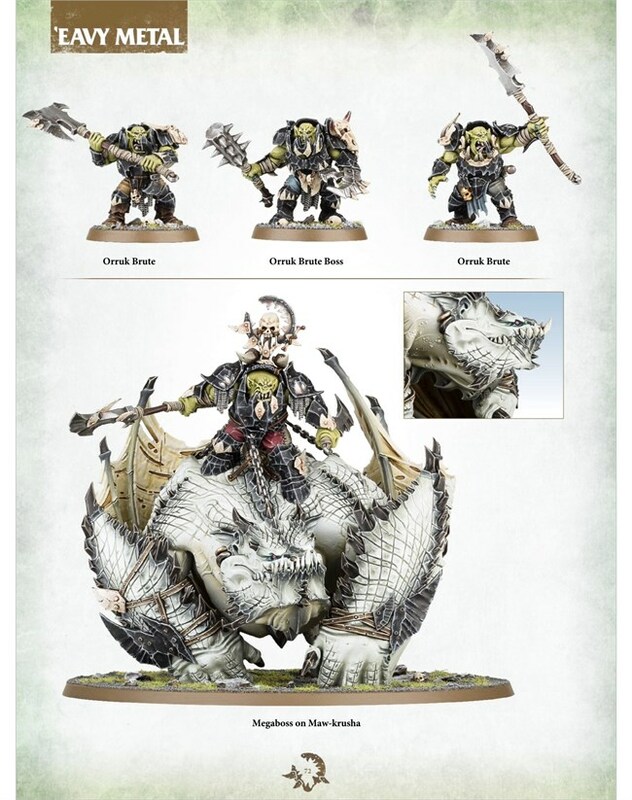 This orruk can here the rhythm of Gork and Mork in his head which he then has to beat out on everything and anything within reach. That's why the mini for him just has the bone clubs and no drum, he doesn't need a drum, that's what the rocks, enemy's head, or even his own boyz heads are for. Both of these have a ton of character to them and I love it. Another one I think is a lot of fun are the 'Ard Boyz. Like I mentioned before these use to be the Black Orcs, who were the toughest of the tough. Now they are still tougher than most orruks, but considerably weaker than the Ironjawz. Wanting to prove their strength though they flock to Ironjaw bosses and fight alongside them. The Ironjawz tolerate them since they think they are tough enough, but think they are a little odd with their carefully forged armor and their tendency to march in blocks and generally be organized. I really like how they were able to carry over what we knew about the Black Orcs but make them fit soundly within the new AoS background. 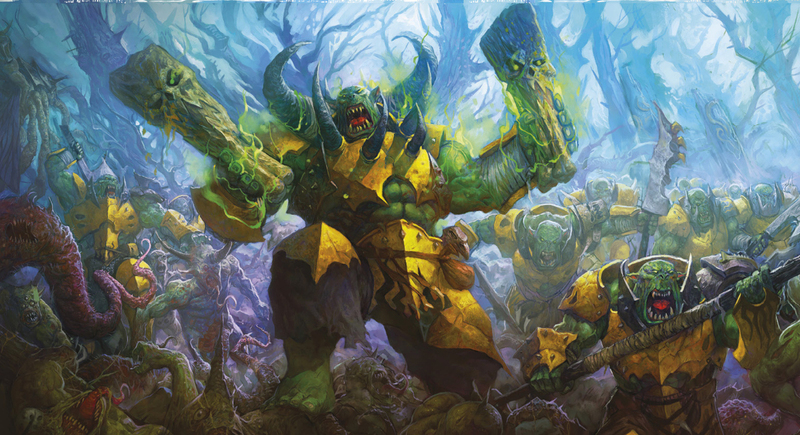 I think it would be pretty fun to read a few stories about the 'Ard Boyz and Ironjawz interacting. Before I carry on I have to mention how great the artwork is in this book. I know I say that with every one of them, but I mean it with every one of them. Usually there are one or two pieces that don't live up to the quality of the book, but every piece of art in here is great. There is also the usual army colors section with several different color schemes for the orruks shown off as well as the miniature showcase. 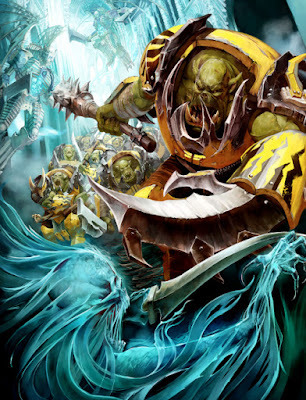 We get to see a few different army schemes for the Ironjawz actually painted including the yellow, red, blue, and black armor. One thing I liked about this is that they also painted the orruk's skin slightly different in each army so you can see a few different ways to paint the green skin. The book has three battleplans, just like most of the other battletomes. The first one revolves around a tribe of Ironjawz rampaging into Shyish to cause some havoc. Quite literally, all they are looking for is a good fight, which leads them to the city of Crookback on the river of souls. The orruks rampage through the city destroying everything they can and ultimately pick a fight with the city's vampire overlord who makes her home on a giant barge. It's a fun ready and has some great art including a really nice map. The battleplan itself, Tornado of Destruction, has the orruks attempting to vandalize as many pieces of scenery as possible before the end of the fifth turn. If they can vandalize over half of it they win, otherwise the defender wins. I really like the idea of this battleplan since it suits the orruks rampaging nature so well. It's perfect for them to have no goal other that wanton destruction. The second battleplan, Headlong Onslaught, follows a horde of rampaging Ironjawz who have been terrorizing Ghyran, destroying all in their path, only to come to a stop at a giant chasm in the earth. Not to be denied they promptly cut down a giant tree to bridge the gap. Luckily the Seraphon are watching and teleport down to this massive tree bridge to try and stop the orruks. The battleplan itself is pretty interesting with a cross set up. The defenders set up along the horizontal section, while the orruks are on the far end of the long section. They must break through the defender's lines to get to the other side, claiming a major victory if they can get at least a quarter of their starting force into the objective zone. I always love battleplans that have interesting map set ups, especially when they break the traditional 6' x 4' table we all know. The last battleplan focuses on Gordrakk as he attempts to spring a trap at the Growling Gates. This system of realmgates in Ghur used to lead to Hysh but have long been in the grasp of Chaos. The Stormcasts have established a fortress on the other side of the gates in Hysh and lightning strike in to attempt to win them back from Chaos, only to find that the warriors they thought they were going to have to fight had already been defeated. Instead they are ambushed by wave after wave of Ironjawz. Gordrakk's plan is to wear down the Stormcast so much that they see no other option but to reopen the gate to Hysh and call in reinforcements, at the same time opening up the way for Gordrakk's force to then pour through and conquer a new realm. The battleplan itself, Dead Cunning, has the orruks surrounding the Stormcasts and whoever controls the central realmgate at the end of four turns wins. Before the battle actually starts a mini dice game is played called "Hey, Sucker!" This is played three times in a row and for each time the Orruks win they get to choose a bonus for the battle. These bonuses range from all Orruk wizards being able to cast three spells a turns to fighting two combat phases in a row in the first turn. Pretty much every one of them is a huge boon to the Orruk player. They could end up with none of them or three of them. I think this is my favorite battleplan of the bunch, both for the story it tells and the uniqueness of the battleplan itself. I could see this being a particularly hard fought battle, especially for the defender, and the fact that it only lasts for four turns just further reinforces how brutal it's likely to be. In order to claim the objective you need to have the only models within three inches of it, which seems like it would be rather difficult. One of my friends just bought a bunch of Ironjawz stuff so I think I will give this battleplan a try the next time we get a game in. After the battleplans we get the warscrolls and battalions. I won't go over the warscrolls much since you can find them online for free. Gordrakk is a beast though and his command ability is pretty insane, especially if you are using battalions. I expect to see him in a lot of Destruction armies going forward. This army is really tough in general and I think Ironjawz armies will be pretty hard to beat across the board. The battalions is where this really shines for me. I think these battalions are some of the fluffiest, easiest to collect, and most fun battalions I have seen so far. There are five battalions, with each one focusing on a different type of "Fist" which is what they name their fighting groups (remember the counting on fingers thing). For example, the Brutefist consists of four units of Ironjawz Brutes, the basic fighting unit of the army. Besides the bonus you get it also upgrades one of your Brute champions into the Brute Boss, giving him more wounds, essentially making him a mini character. All of the battalions that don't contain characters do this. Another one of my favorites in the Ardfist which is just three units of 'Ard Boyz and a Warchanter. I just think it's a cool idea. There is also the Ironfist which contains one of each type of unit and I expect we will see a lot of. It has good bonuses, rewards you for buying one of each type of unit, and doesn't require an unrealistic number of models to make. At the end their is also the obligatory battalion that contains all of the other battalions for your truly massive games. This is the only one that includes a Megaboss at all. Just like every other battletome the book wraps up with the basic four pages of rules and that's that. Overall this is a fantastic book with really fun and engaging lore, some of the best artwork to date, and a truly tough army for the table top. If you like orruks I definitely would recommend this book. All of these units are in the Grand Alliance book for Destruction if you are just after the rules, but there are no battalions in that one and the lore included is extremely basic. 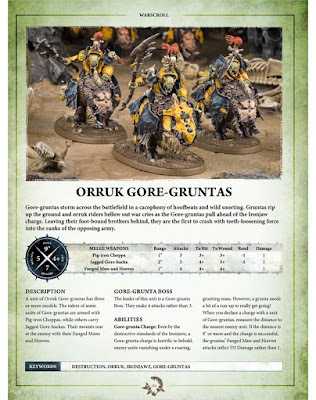 The option is there though, which gives you several different price points to buy into this army, plus, don't forget the rules are free online or in the App. If you like to keep up on the AoS lore, like greenskins, or just want a fun read then I highly recommend you pick this up. Final Score - 5/5 Waaaaaaagggghhhhhh!